The Horns have a clear plan to get everyone involved. That much was obvious. Kobe Boyce, Jeffrey McCulloch both snag interceptions as defense shows out. 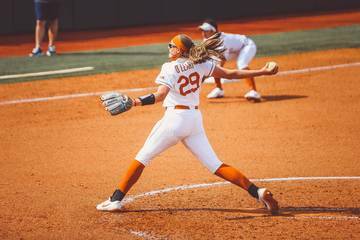 When Texas athletic director Chris De Conte convenes his cabinet on Monday to discuss the weekend, he’ll say the Orange-White spring game was a raging, if wind-blown, success. Thousands packed Bevo Boulevard on Saturday afternoon in the sunny but windy conditions. Hundreds stayed afterward for a blustery autograph session, and Ludacris held firm in ludicrous conditions on the LBJ Lawn. When Herman convenes his staff on Monday, he might be a tad downbeat. The swirling winds inside Royal-Memorial Stadium made throwing deep balls almost untenable. The Longhorns really weren’t able to showcase all of their new weaponry. Quarterback Sam Ehlinger completed just nine of 21 passes for 66 yards, but he finished the spring game — and got through all 15 spring practices — healthy. Thus, it was a success. The defense ruled the night as that unit finished the spring on a high note in the 12-6 White victory. All spring long, players and coaches on both sides of the ball talked up the offense. Even without injured receiver Collin Johnson, Texas still had firepower with Keaontay Ingram, Devin Duvernay, Brennan Eagles and Malcolm Epps. Freshmen Jordan Whittington and Bru McCoy were making head-turning plays every time out, or so it seemed via UT’s social media. 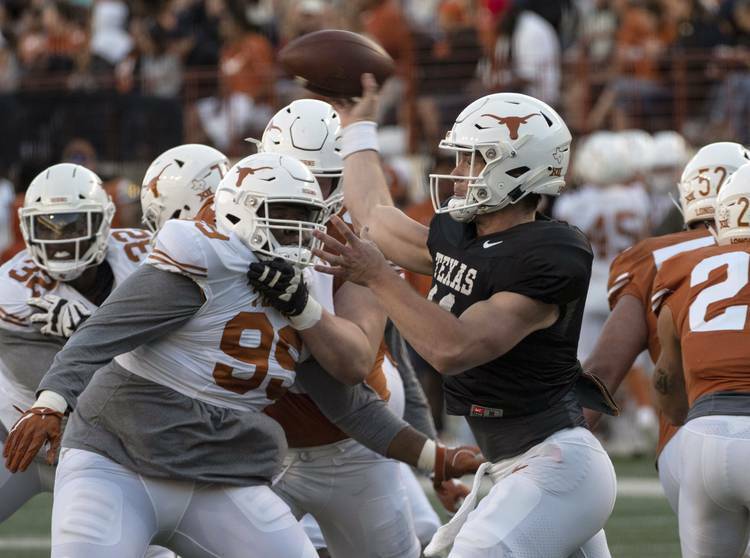 The spring game final stats don’t necessarily show this unit’s potential, but the Horns have a clear plan to get everyone involved. That much was obvious. Epps had the longest catch of the spring game — a 25-yarder from Ehlinger. Duvernay did have a nice catch over the middle, bounced off a tackle attempt by D’Shawn Jamison and turned upfield for 20 yards. Whittington ran 12 times for 62 yards and had four catches for 27 yards. Ehlinger targeted him on a 27-yard wheel route. But credit linebacker Joseph Ossai for smothering the play, which ended with an incompletion. Ingram also couldn’t reel in another long pass into the end zone with linebacker Jeffrey McCulloch running step for step. Fans let out a faint “Bruuuu” cheer when McCoy made his first of three catches on the night. He and incoming freshman Jake Smith figure to get plenty of targets this fall. Both won high school national player of the year honors in high school. The running game has shown marked improvement this spring, from all indications. Herman said the first-team offensive line “got a lot better, a lot more cohesive.” And this is before Georgia Tech transfer Parker Braun, an All-ACC pick last year, joins the fray this August. This group should be able to score points this fall, even if fans didn’t see many Saturday. Backup quarterback Casey Thompson’s running may have been the offensive highlight of the night. Thompson, who redshirted last season, ran 11 times for 47 yards. Some of those runs were cut short, as officials blew the whistle early for Thompson’s protection. He could have escaped others. McCulloch had the game’s best defensive play when he jumped the route and intercepted an Ehlinger pass over the middle for Ingram. He raced all the way to the 1-yard line. In came Thompson and the second-team offensive line. Backup center Rafiti Ghirmai has been a “work in progress” all spring, according to Herman. He rolled three consecutive snaps to Thompson, who scooped the ball off the ground each time from the shotgun formation. On fourth-and-goal from the 1, Thompson found his way around the left end for the touchdown. It was the game’s only touchdown. Kicker Cameron Dicker hit from 36 and 52 yards for the only other points scored all night. Defensively, there was a lot to like. Jalen Green hammered Whittington in the flat and later made a solid tackle on Epps. Junior transfer Jacoby Jones could’ve had a sack if officials would have let him smash Thompson. He also batted a ball down at the line of scrimmage. Chris Brown flashed good speed on a delayed blitz, but Ayodele Adeoye got credit for a sack. Kobe Boyce had an early interception off Ehlinger, and Luke Brockermeyer had two tackles for loss. “It is what it is, but at the end of the day, we’re competitive and we want to score a lot of points,” Shackelford said. Overall, the Horns finish spring feeling good about where things are headed. In the end, nobody will care what happened on a blustery, cool April night.